Heart rate variability (HRV) refers to the beat-to-beat alterations in heart rate. The origin of heartbeat is located in a sino-atrial (SA) node of the heart, where a group of specialized cells continuously generates an electrical impulse spreading all over the heart muscle through specialized pathways and creating process of heart muscle contraction well synchronized between both atriums and ventricles. The SA node generates such impulses about 100 – 120 times per minute at rest. However, in a healthy individual, the resting heart rate (HR) would never be that high. This is due to continuous control of the autonomic nervous system (ANS) over the output of SA node activity. Its net regulatory effect gives real HR. In a healthy subject at rest, it ranges between 60 and 80 beats per minute. The autonomic nervous system is a part of the nervous system that non-voluntarily controls all organs and systems of the body. As the other part of nervous system ANS has its central (nuclei located in brain stem) and peripheral components (afferent and efferent fibers and peripheral ganglia) accessing all internal organs. There are two branches of the autonomic nervous system - sympathetic and parasympathetic (vagal) nervous systems that always work as antagonists in their effect on target organs. For most organs including heart, the sympathetic nervous system stimulates organ’s functioning. An increase in sympathetic stimulation causes an increase in HR, stroke volume, systemic vasoconstriction, etc. In contrast, the parasympathetic nervous system inhibits functioning of those organs. 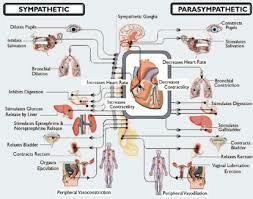 An increase in parasympathetic stimulation causes a decrease in HR, stroke volume, systemic vasodilatation, etc. A heart response time to sympathetic stimulation is relatively slow. It takes about 5 seconds to increase HR after actual onset of sympathetic stimulation and almost 30 seconds to reach its peak steady level. The heart’s response to parasympathetic stimulation is almost instantaneous. Depending on actual phase of heart cycle, it takes just 1 or 2 heartbeats before heart slows down to its minimum proportional to the level of stimulation. At rest, both sympathetic and parasympathetic systems are active with parasympathetic dominance. The actual balance between them is constantly changing in attempt to achieve optimum considering all internal and external stimuli. There are various factors affecting autonomic regulation of the heart, including but not limited to respiration, thermoregulation, humoral regulation (rennin-angiotensin system), blood pressure, cardiac output, etc. One of the most important factors is blood pressure. There are special baroreceptive cells in the hear and large blood vessels that sense blood pressure level and send afferent stimulation to central structures of the ANS that control HR and blood vessel tonus primarily through sympathetic and somewhat parasympathetic systems forming continuous feedback dedicated to maintain systemic blood pressure. This mechanism is also called baroreflex, which increases HR when blood pressure decreases and vice versa. This mechanism is also targeted to maintain optimal cardiac output. The heart rate variability analysis is a powerful tool in assessment of the autonomic function. It is an accurate, reliable, reproducible, yet simple to measure and process. 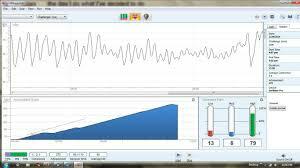 The source information for HRV is a continuous beat-by-beat measurement of interbeat intervals. The electrocardiograph (ECG or EKG) is considered as the best way to measure interbeat intervals. ECG is an electrical signal measured with special conductive electrodes placed on chest around heart area or limbs. It reflects minute changes in electrical field generated by heart muscle cells originating from its SA node. ECG signal has a very specific and robust waveform simple to detect and analyze. Because of that cardiac rhythm derived from ECG is the best way to detect not only true sinus rhythm but all types of ectopic heartbeats, which must be excluded from consideration of HRV analysis. 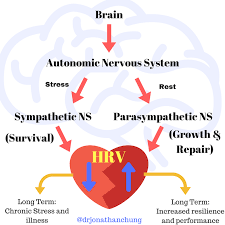 It is found that lowered HRV is associated with aging, decreased autonomic activity, hormonal tonus, specific types of autonomic neuropathies (e.g. diabetic neuropathy) and increased risk of sudden cardiac death after acute MI. Other research indicated that depression, panic disorders and anxiety have negative impact on autonomic function, typically causing depletion of parasympathetic tonus. On the other hand an increased sympathetic tonus is associated with lowered threshold of ventricular fibrillation. These two factors could explain why such autonomic imbalance caused by significant mental and emotional stress increases risk of acute MI followed by sudden cardiac death. Aside from that, there are multiple studies indicating that HRV is quite useful as a way to quantitatively measure physiological changes caused by various interventions both pharmacological and non-pharmacological during treatment of many pathological conditions having significant manifestation of lowered HRV. Predictor of risk of arrhythmic events or sudden cardiac death after acute MI. Clinical marker of diabetic neuropathy evolution. Nevertheless, as the number of clinical studies involving HRV in various clinical aspects and conditions grows, HRV remains one of the most promising methods of investigating general health in the future. 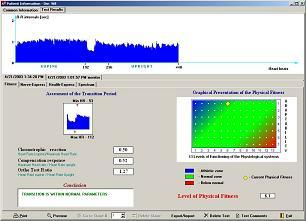 At the Da Vinci Holistic Health Centre we use the Orthostatic Test when measuring HRV. During the test, the patient rises from a supine to a standing position. Normally this causes an immediate increase in heart rate and reaches its maximum level at about 15th heartbeat after beginning to stand. It is followed by a relative bradycardia that reaches its maximum around 30th heartbeat. The phenomena can be quantified as 30:15 ratio, which is the ratio of the longest R-R interval around 30th heartbeat to the shortest interval around 15th heartbeat. Kawachi I, Sparrow D, Vokonas PS, Weiss ST. Decreased heart rate variability in men with phobic anxiety. Am J Cardiol 1995; 75: 882-885. Kristal-Boneh E, Raifel M, Froom P, Ribak J. Heart rate variability in health and disease. Scan J Work Environ Health 1995; 21: 85-95. Offerhaus RE. Heart rate variability in psychiatry. In: RJ Kitney, Rompelman O (eds). The Study of Heart Rate Variability. Oxford: OxfordUniversity Press, 1980: 225-238. Sloan RP, Shapiro PA, Bigger T Jr, Bagiella E, Steinman RC, Gorman JM. Cardiac autonomic control and hostility in healthy subjects. Am J Cardiol 1994; 74: 298-300. Task Force of the European Society of Cardiology and the North American Society of Pacing and Electrophysiology. Heart rate variability: standards of measurement, physiological interpretation and clinical use. Circulation 1996; 93: 1043-65. Yeragani VK, Balon R, Pohl R, Ramesh C, Glitz D, Weinberg P, Merlos B. Decreased R-R variance in panic disorder patients. Acta Psychiatr Scand 1990; 81: 554-559. Yeragani VK, Pohl R, Berger R, Balon R, Ramesh C, Glitz D, Srinivasan K, Weinberg P. Decreased heart rate variability in panic disorder patients: a study of power-spectral analysis of heart rate. Psychiatry Res 1993; 46: 89-103. Copyright Biocom Technologies all rights reserved.